After graduating from middle school I went to sports high school. I started achieving some good results and it was a fulfilling feeling. Greatest racing memory: Every time I get to talk to Polish riders in international races, it’s special. One moment that stands out comes from the Presidential Tour of Turkey, which was a farewell race for Przemysław Niemiec. After the last stage we could celebrate with him as he moved on to cycling retirement. I also enjoyed the Junior Paris-Roubaix. Race I dream of winning: I would love to take a solo win at Paris-Roubaix. I’m always impressed with the atmosphere there and the fans. It also ends on a track. If I wasn't a pro cyclist: I think I would go to the military, preferably to Operational-Maneuver Response Group. Young sprint sensation Szymon Sajnok is the current world champion in the omnium on the track, winning the elite title at just 20 years old. The rainbow jersey was a good omen coming into the 2018 road season, and Sajnok also sprinted to 2nd place in one of the stages at Tour de l’Avenir stage race in France. Sajnok combines top notch sprinting skills with solid time trialing abilities. 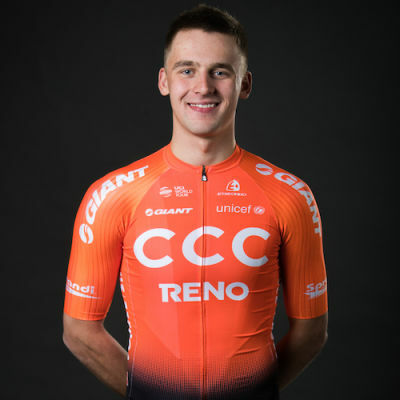 He is the silver medalists from the 2017 U23 Polish National Championships, gold medalist in the junior category from 2015, and winner of the Tour de Kumano’s prologue.